This post is brought to you by Sony. We’re massive fans of Sony cameras, so we’re really interested in two new Action Cam models that challenge the GoPro status quo. To show off the eye-popping capabilities of its high-def duo — the 4K and the Full HD — Sony commissioned more than 20 short films shot on the tiny video cameras by directors from all over the world. The first batch of the Never Before Seen shorts show how innovative filmmakers and artists utilize the Action Cams’ small size, enhanced image stability and other unique features to make Hollywood-level videos. Ranging from crafty experiments and audacious stunts to short documentaries, sports adventures and scripted short stories, the films celebrate creativity in all its forms and use Action Cams to provide unique new perspectives on the production process and the stories themselves. The first handful of films give you a feel for the series’ potential. The Picture Machine, directed by Studio Nos, uses an Action Cam mounted inside a little vehicle that drives around the inside of a skillfully painted zoetrope. It re-creates one of the oldest forms of animation to produce the effect of dancing, animated mushrooms. Ryan Dzierzek’s Creature, embedded above, is more like a sci-fi movie. The short film shows what might happen if laboratory scientists brought back to life a creature that ought to have remained extinct. Paperports, by Charles Young, sends an Action Cam onto the streets of a tiny seaport city built of paper. Wonder, by Michaela McKee, captures kids’ playtime and augments the antics with animation. Greg Hackett’s TKO, embedded below, bobs and weaves into traditional action-cam territory. The filmmakers mounted multiple Sony Action Cams on a boxer’s forearm and head, then set the black-and-white short to the funky beats of session drummer Bernard “Pretty” Purdie. The rest of the films will be gradually released on Sony’s Never Before Seen website as well as the Sony Action Cam YouTube channel. Each of the highly inventive and fun short films showcases the incredible range of what can be done with Sony’s awesome new video cameras. And the Never Before Seen series isn’t the only place you can see the an Action Cam in action: A thrilling video of an eagle diving from a Chinese skyscraper went viral earlier this year, giving millions of viewers a look at the Sony cameras’ capabilities. What features make the magic happen? 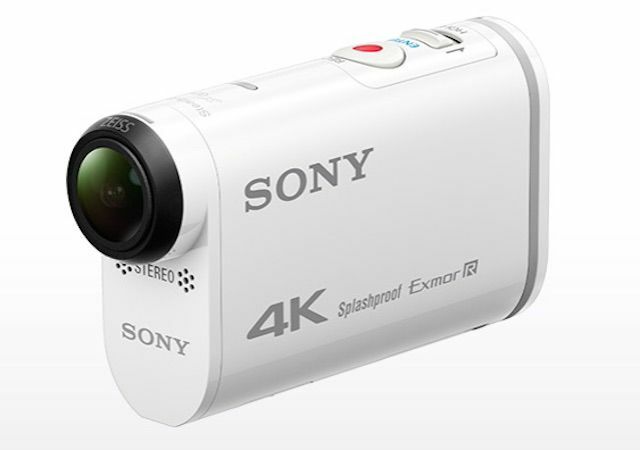 Sony’s latest addition to its Action Cam lineup, the 4K (model number FDR-X1000V), combines all the features experienced users have been waiting for: 4K picture quality equal to that of current Hollywood blockbusters and support for the professional-grade XAVC S codec to ensure beautiful footage with high-bitrate recording. It shoots in two modes: 4K (30P 100Mbps) and 2K (1080 120P 100Mbps). Also newly released is Sony’s Full HD (HDR-AS200V), which shoots 2K (1080 120P 50Mbps). Both combine a cutting-edge Exmor R CMOS sensor and a BionzX processor paired with SteadyShot image stabilization for fast action and smooth motion, as well as an ultra-wide-angle, 170-degree Zeiss Tessar lens. Both the new cameras also capture stunning, high-quality audio, thanks to a stereo mic coupled and Sony’s Wind Noise Reduction technology (neither of which are offered by GoPro). They offer on-the-spot live video streaming on Ustream when tethered to a smartphone or a Wi-Fi router. Built-in GPS and IPX4-class splashproofing make them ideal for shooting video in the great (and sometimes unforgiving) outdoors. And for increased freedom, users can fully operate the cameras, and even edit footage, with a convenient wrist-mounted accessory called the Live-View Remote (model number CX49030, sold separately). 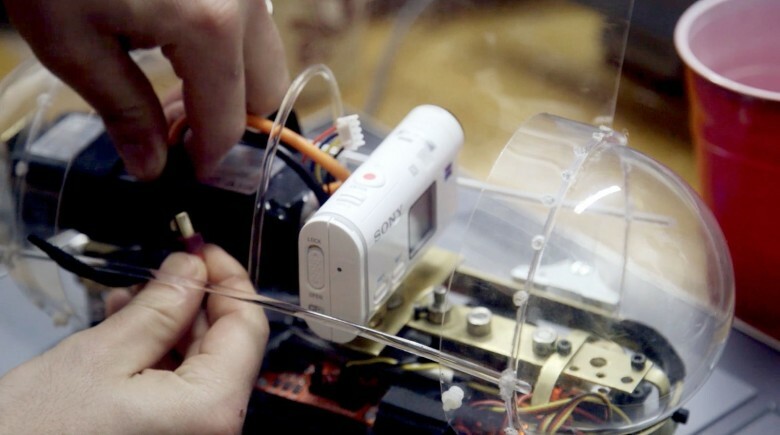 Action Cams are available in brick-and-mortar stores, Amazon and on Sony’s website. The 4K FDR-X1000V goes for $498 on Amazon. The Full HD HDR-AS200V goes for $298.